It is with profound sadness that we, his family, announce the passing of Joseph ‘Joe’ Valrie Boyle of Afton. Joe passed away peacefully at home on Saturday, February 23, 2019 surrounded by his family. Born December 12, 1929, he was the son of the late Thompson and Irene (Murphy) Boyle. Joe was a heavy equipment operator for most of his working life, retiring in 1998 from Construction Aggregates Ltd. His Irish roots in Merland always remained close to his heart and were never forgotten. Joe spent much time at his beloved ‘Old Place’. He is survived by his loving wife of 63 years Margaret (Halloran); sons: Francis (Annette); Terrance "T" (Mary); Glen (Anita) and Ron (Jyl), all of Afton; daughters: Marie (Ted) Connors, Afton; Linda (Rick) Langille, Wentworth; Joann (Glenn) Mattie, St.- Lazare, QC; Valerie (Randy) Pettipas, Tracadie, and Erin (Dave) Brosha, Long Creek, PEI; 28 grandchildren and 12 great-grandchildren; brother Jim (Louise) Boyle, Truro; sister Cathie Beck, Torbrook; sister-in-laws: Louise Boyle, Afton; and Maureen Boyle, Antigonish, and many nieces and nephews. 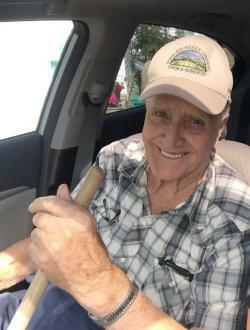 He was predeceased by brothers: Buddy, Eugene and John; sisters: Margie Prosser, Helen Pitts, Pat Alexander and one infant sister; brothers-in-law: Al Prosser, Maurice Pitts, Bruce Alexander, Don Beck and sister-in-law Jeanie Boyle. Visitation will take place on Monday, February 25, 2019 from 2-4pm and 7-9pm in C.L. Curry Funeral Home, 135 College Street, Antigonish. Funeral Mass will be celebrated on Tuesday, February 26, 2019 at 2 pm in St. Peter’s Church, Tracadie with Rev. John Barry officiating. Burial in the parish cemetery. In lieu of flowers, donations may be made to VON Antigonish or St. Peter’s Parish Cemetery Fund. Online condolences: www.clcurry.com.